A 21cm X 30cm (folded to 7.5cm X 10.5cm in proportion), B&W zine on pale blue paper. 1 (of the feet of a swimming bird or other aquatic animal) having the toes connected by a membrane. 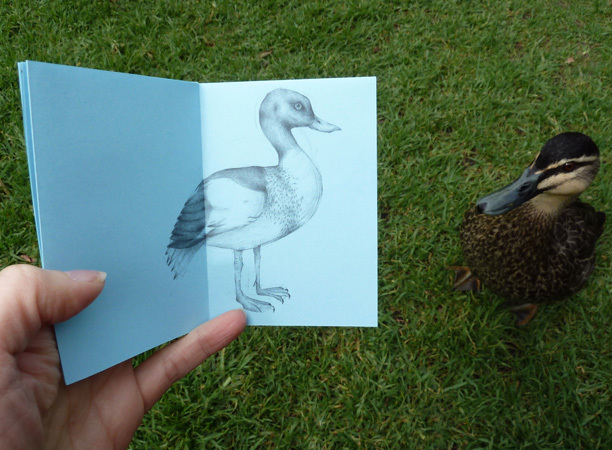 This zine features pencil drawings of a Domestic duck; a Torrent duck from the Andes; a Baikal teal from Siberia; a Red-breasted goose of bright plumage; and a Common shelduck.